Any project will involve a lot of file sharing. Projects allow you to upload unlimited Documents, Mockups, Screenshots, Images, Audio and Video to a project in TeamWave to share it will all your project team members. Every project has a dedicated Files section where you can upload and view all the files uploaded to that project. Files can also be uploaded to tasks and discussions as and when you want to. In discussions, files can be uploaded while posting a new discussion or in the comments section. Let's see how to add files to Files tab in a Project. Files can be uploaded from your computer and can also be linked from your Google Drive and Dropbox accounts. 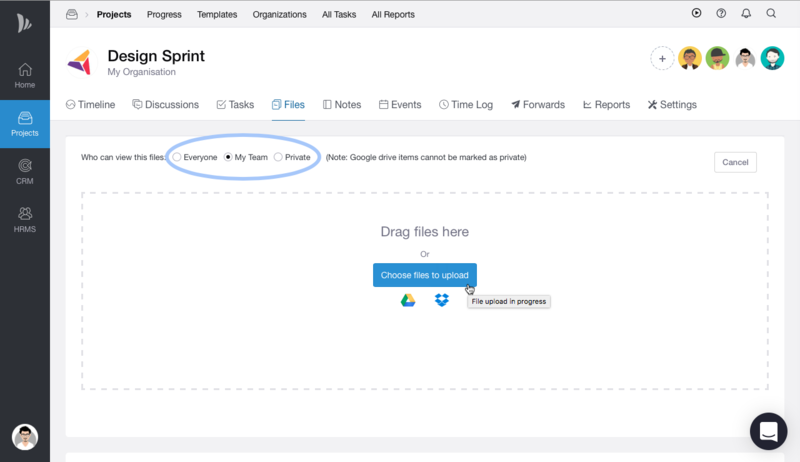 To link files from Google Drive and Dropbox, you need to first integrate them into your TeamWave’s account. Learn about Google integration and Dropbox integration. You cannot set privacy for the files linked from Google Drive and Dropbox. Size limit for each file is 50 MB.